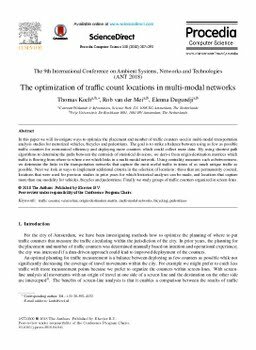 In this paper we will investigate ways to optimize the placement and number of traffic counters used in multi-modal transportation analysis studies for motorized vehicles, bicycles and pedestrians. The goal is to strike a balance between using as few as possible traffic counters for economical efficiency and deploying more counters which could collect more data. By using shortest path algorithms to determine the paths between the centroids of statistical divisions, we derive from origin-destination matrices which traffic is flowing from where to where over which links in a multi-modal network. Using centrality measures such as betweenness, we determine the links in the transportation networks that capture the most useful traffic in terms of as much unique traffic as possible. Next we look at ways to implement additional criteria in the selection of locations: those that are permanently covered, locations that were used for previous studies in prior years for which historical analyses can be made, and locations that capture more than one modality for vehicles, bicycles and pedestrians. Finally we study groups of traffic counters organized in screen-lines.